The Arbuckle Family Blog: Have you ever seen a burning bush? Have you ever seen a burning bush? We had an unfortunate incident on the Fourth of July at Justin's grandparent's house. I think we all know that two 13 year old boys, a six year old boy and fireworks are not a great mix. The boys were setting off some fireworks in Ma and Pa's front yard. They had the great idea to throw one of them into a bush. Yes, this was a very bad idea. My sister-in-law, Beth was on the front porch watching them. All of a sudden she noticed that the bush was smoking. She ran in to tell us that the bush was on fire. 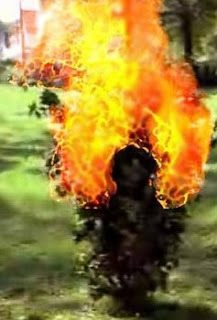 She actually ran in and yelled, THE BUSH IS ON FIRE!!! Her cousin, mom and couple of us kind of blew her off and said, oh it is probably just a smoke bomb. I got up and decided to fill up a couple of water bottles just in case it was on fire. Beth left us and walked back outside. A second later she ran inside and into the other room (where all the guys were) and yelled, HELP, THE BUSH IS ON FIRE AND IT IS GOING TO BURN DOWN THE HOUSE!!! Of course, everyone jumped up and ran outside, including myself with two little bottles of water. This is what we saw (well, this is not the exact picture, but I didn't think to grab my camera to capture all the excitement). This was the only picture I could find that somewhat captured what we encountered. I am not kidding or exaggerating, this what the bush looked like, except the bush was bigger than this one in the picture. Lets just say that my two little bottles of water, would have done nothing to put out the flame. Justin's cousin quickly grabbed a hose and put out the flame. No real damage done, except for the damage done to the bush. We are fairly certain the bush is not going to survive. Justin's grandparents are hard of hearing and had no idea what was going on. I still don't think they ever told them. The moral of the story... don't give teenagers and young boys fireworks to wreak havoc on their own... and make sure you listen to your sister-in-law, even if she is known to exaggerate stories in the past. I can't decide it that is funny or not. comical since I know most parties involved and Megan and I were talking about houw the 4th just isn't the same without the Arbuckles.